A perfect home for a traveling couple, this luxurious retreat has a unique layout with seating areas both upstairs and downstairs. 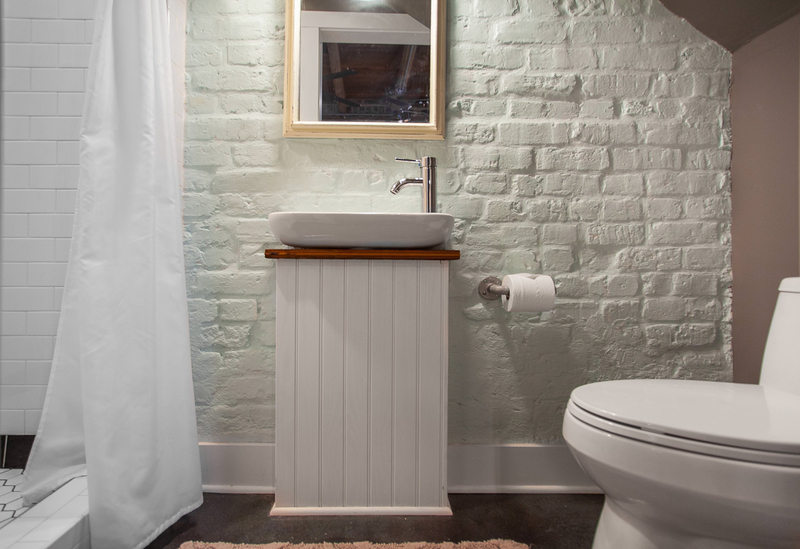 The alternating exposed brick and grey wood panel walls give a rustic feel to the industrial decor. You’ll find everything you need for a comfortable and relaxing stay. 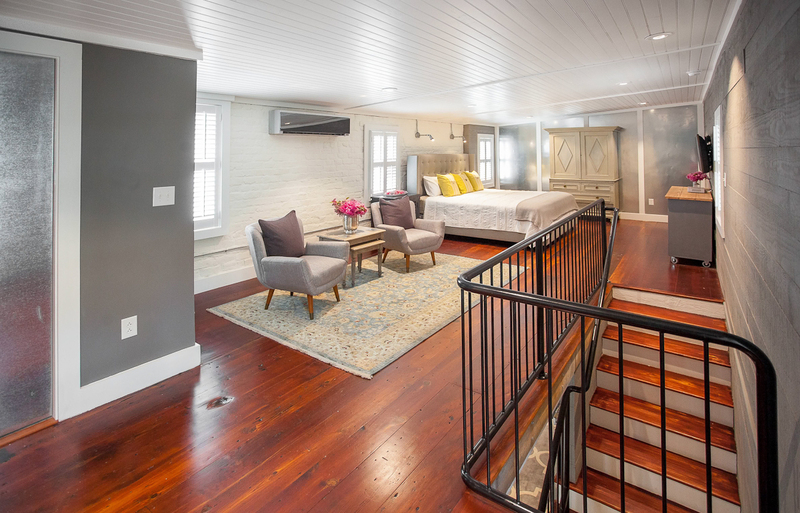 The first floor has a large couch and TV, a dining table for four, and a half bath tucked away under the staircase. 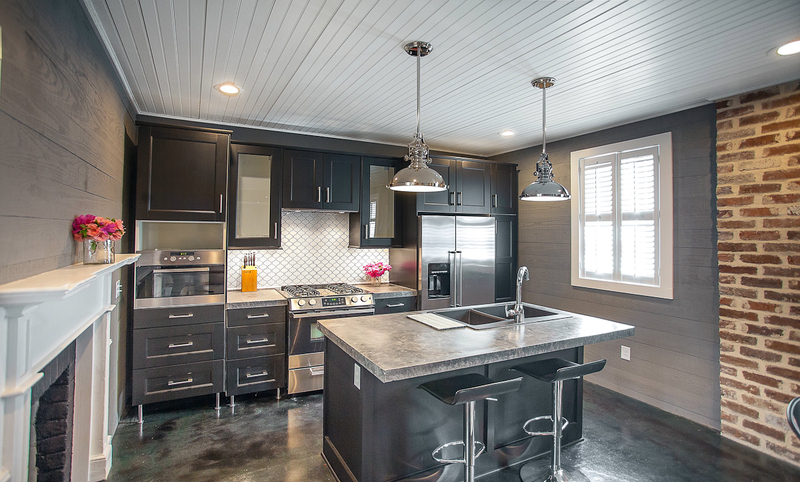 The kitchen has stainless steel appliances, beautiful dark cabinets, and a breakfast bar for morning musings. 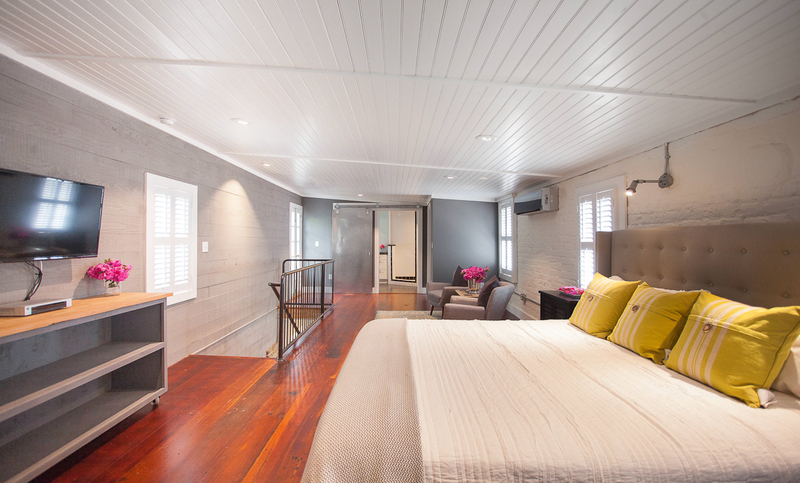 Upstairs is a spacious master suite with a king sized bed and sitting area. The balcony off of the bedroom is perfect for catching a sunset, having a cup of coffee, or reading a book. 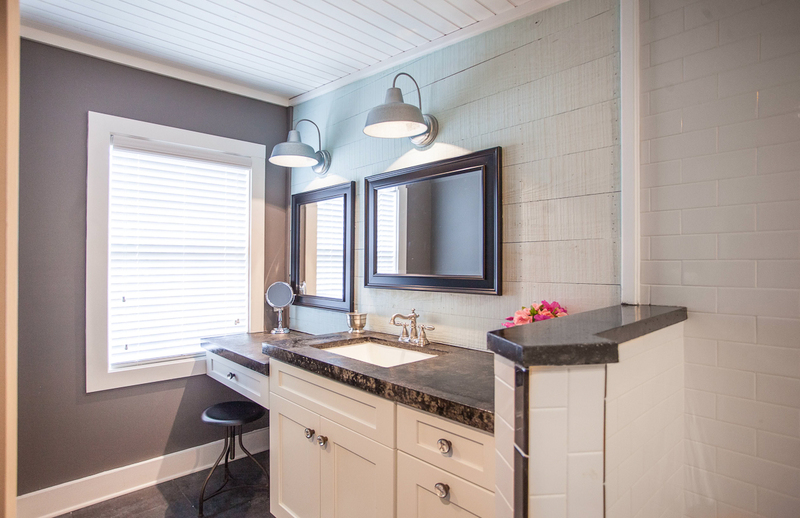 The bathroom has an open shower with built-in seating and a large vanity with plenty of room to get ready for an evening on the town. You’ll be just a quick walk from Mrs. Wilkes Dining House on Jones Street, where you’ll find some of the best Southern home cooking in the city. Take a leisurely morning stroll through Forsyth Park to people watch while having coffee at the Sentient Bean, and don’t forget to check their upcoming events for live music and theatrical performances! 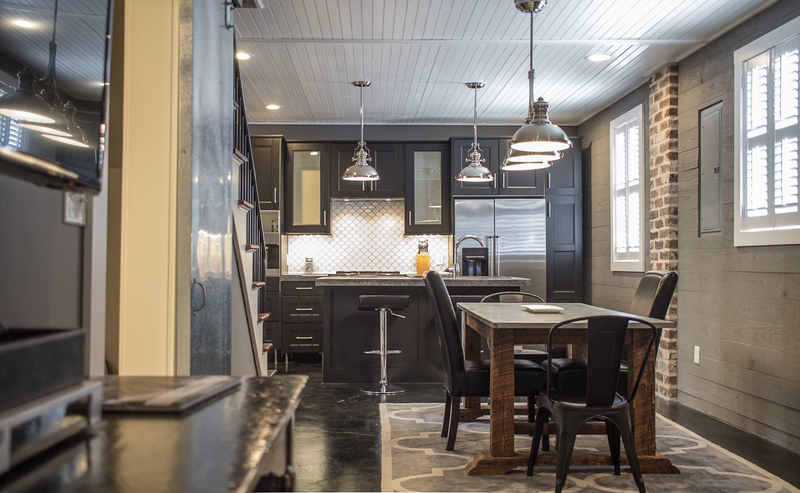 - The modern updates to this home make it a one-of-a-kind historic home with amenities you won't find anywhere else! - A walk down Whitaker Street will bring you to several locally owned shops, including One Fish Two Fish, Number Four Eleven, and Lily Bay Studio + Bazaar. Savannah is the most beautiful city we've been to. Our rental was right in the middle of the historic district and an easy walk to everything Savannah has to offer. The only complaint I can think of is parking and we figured that out by day 2. Amazing property, wonderful courtyard. The property is in a good location in terms of being able to walk the various squares, catching the free bus loop and parking. However, it is on a very busy street, with constant traffic noise at all hours of day and night; you have to try really really hard at night to tune it out. The property itself needs just a little TLC and/or final touches, for example: the area rugs are beyond dirty. This has been mentioned in previous reviews yet they look like they have never been cleaned. We never walked barefoot because of this. The main entrance door lock is extremely difficult. I would recommend having the kitchen door be the main entrance way, so you do not have to walk over mislaid bricks that are an accident waiting to happen, and the outside light by the main entrance into the property never went on (and could not find a wall switch to try and turn it on). However, the kitchen entrance doorway does have a light outside that turns on automatically at dust (hummm). Overall, if you do not mind the outside noise, it is a very nice area to stay at. 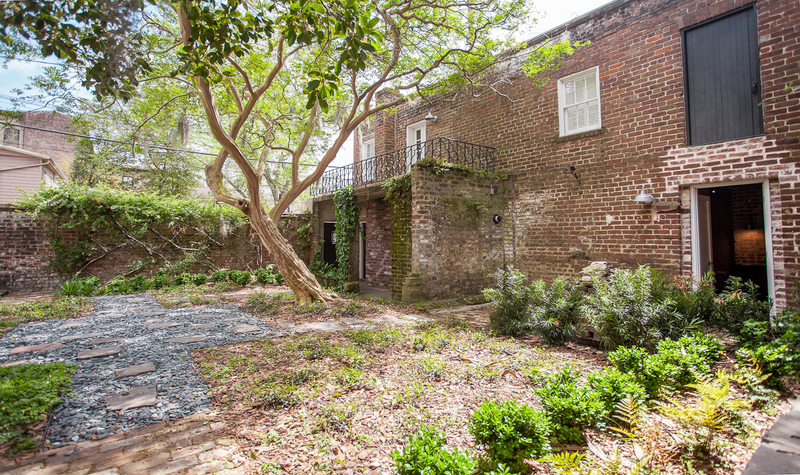 Things we loved about this rental: The location near Forsyth Park. The balcony overlooking the courtyard. The well stocked kitchen. The fun decor. The oh so comfortable bed. Things we didn't love: The slippery stairs and upstairs floor. The tricky lock on the door to the rental. The not so clean downstairs rugs. (Not a good first impression.) These three minor annoyances would not keep us from renting it again. This rental had it all! Perfect location, easy check in and out, clean, unique, and an extremely comfortable bed. My husband and I will definitely stay here again on our next visit. We had a great experience overall. The rental was the perfect size for one couple. 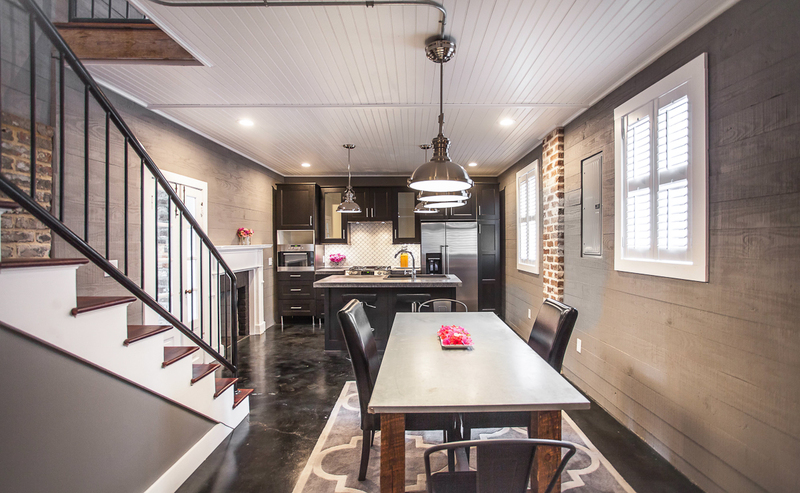 It was clean and modern on the inside and had lots of Savannah character on the outside! We loved the shared garden space and sat out on our little porch each night and took in all of the sights and sounds of the city. We ate all of our meals out, but the kitchen was fully stocked had we wanted to dine in. The bed was super comfy and inviting. The cable package was limited, but the a huge deal for us as we spent most of our time out exploring the city. The house was within walking distance of anything you could want to do. A ten minute walk from River street a 20 minute drive to Tybee. You really can’t beat the location! When we arrived we stopped to buy a parking pass for the long weekend but because the house was so close to Gaston street (and all parking is free south of Gaston) we just found some place close by and parked for free. There was an alley directly behind the rental for easy unloading as well. The check in and checkout process couldn’t have been easier. We will definykeep this place in mind for future stays! This home sits near Forsythe Park and is within walking distance of downtown. It shares an enclosed courtyard with the main house. Street noise at night can be easily overcome by downloading a Sleep Sounds app on your phone. The kitchen feels unfinished as there are no doors on the cabinet under the sink and the shelf above the microwave is missing. Entering the house for the first time is confusing since you enter the courtyard and have to walk to the opposite end of the house to enter. We enjoyed this home and have already booked another stay here. Lucky Savannah has provided professional service and beautiful rentals for us on several trips to Savannah. Awesome home in a great location! 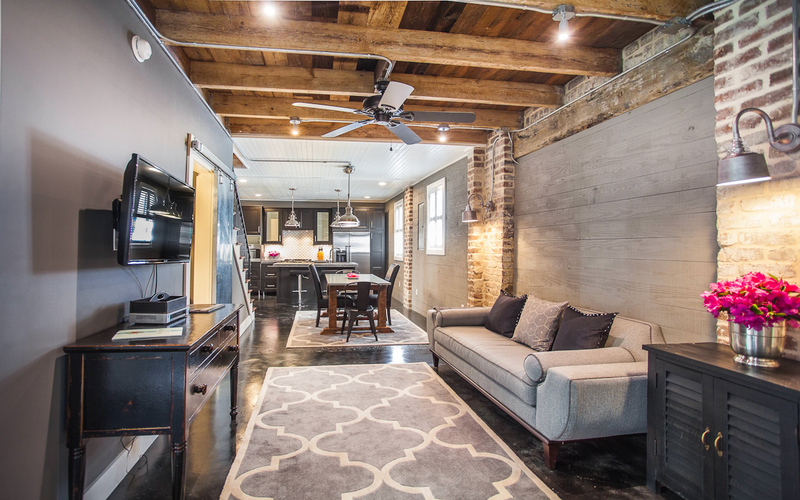 Loved the furnishings, exposed brick & industrial look to this adorable townhome. The patio and balconies were also a plus. We walked everywhere & Forsyth Park is across the street. Parking was easy on the side street. After the first day we got a parking pass at the visitor center. Will definitely stay here again! Ideal combination of convenience and comfort while being able to live in the style of the unique local community you came to explore. The location was perfect for us. Everything we did in Savannah was within walking distance, unit was very comfortable. We found free street parking a few blocks away on Berrian St. Would definitely recommend! Hi Ben! Thank you for choosing Lucky Savannah! We're so glad your enjoy the location and comfort of your rental. We hope to host you again soon! We've stayed in this carriage house twice and love the location. It's near Forsythe Park and easy walking distance to a lot of restaurants and shopping, without being in the middle of the heavy tourist area around Broughton and Bay Streets. The home has a lovely private courtyard with a table and chairs. The only drawback for us is the noise. The home sits directly on a very busy street and buses, police, ambulances come by at all hours. I suggest downloading or using a noise cancelling app. and i would suggest you get the visitors parking pass. It was a little hard to fine at first because there really isn't a front door like I am used to. But would go back anytime. Absolutely wonderful accommodations! 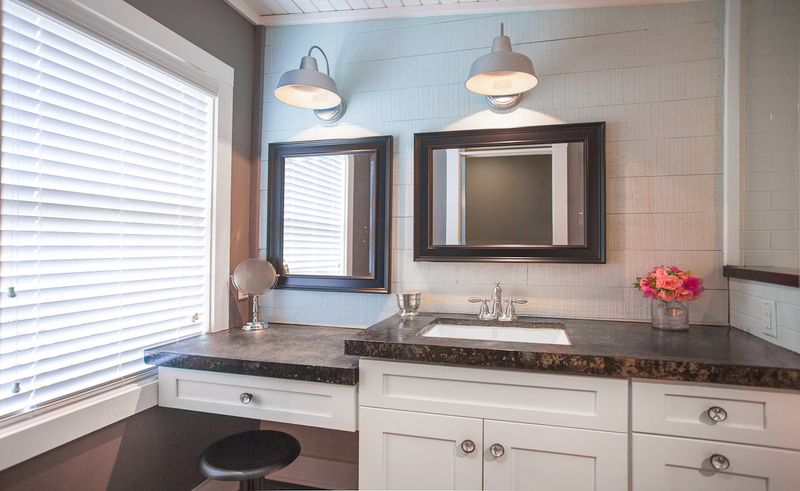 Perfect location right near Forsyth Park. 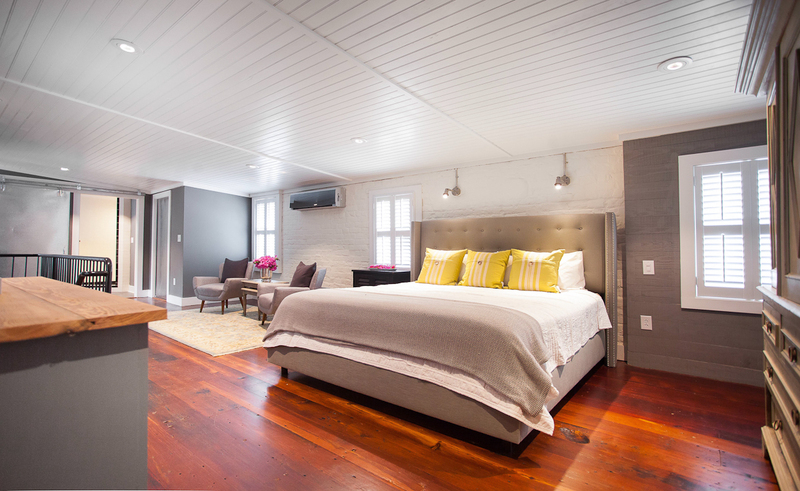 This is a former carriage house transformed into a wonderful place to stay. It shows vintage details while at the same time mixing contemporary designs. Two large levels with the bedroom on the upper level. Upstairs includes a balcony overlooking a courtyard. Only thing that I would suggest would be a larger coffee pot. We invited another couple over for coffee. The pot can only make 2 cups at a time. We will definitely be back. Hi Mary! Thank you so much for your kind words about Whitaker Lane. We will absolutely pass along your coffee pot suggestion. See you again soon! Perfect in every way. Loved the proximity to Forsythe Park. We walked pretty much everywhere, but Uber was just a $6 ride from River St.
Hi Bradford! Thank you for staying at Whitaker Lane for St. Patrick's Day. We look forward to hosting you again soon! Our stay at the Whitaker Carrage House was wonderful, the space is very much my style, clean, efficient and comfortable. Having coffe on the balcony off the bedroom was so relaxing. My fiancé thought the bed was one of the most comfortable she had ever slept in. The court yard is beautiful, there is a tree in the center that is so amazing. Forsyth park is less than a block away, It is the most beautiful southern park of all. I've stayed in many properties in Savannah while visiting my daughter who attends SCAD, all of which were very nice, But the Whitaker home stands out. Hi John! Thank you so much for your kind words about Whitaker Lane and our beautiful city. We look forward to hosting you again soon. They were very efficient and I loved the app. It made things very easy. The noise on the street kept us up at night but that was not anything they could control.Some comfy seats on the balcony would be nice! Thanks for staying with us, Kelly! We'll pass along your suggestion of balcony seating. Please know you're privy to a Return Guest Discount next time you stay with us. The apartment is awesome. Has everything you need. A little bit of a walk to the riverfront but this is a reason to visit all the squares and see the houses. Try parking next to the animal hospital two blocks away. We were able to park there for free for four days. Don't expect a hello or a wave from the woman you share the garden common space. Very unfriendly. Stay away from the restaurant Jazz'd. Food was not very good and was expensive. Would stay at this place again no questions asked. Hi Tony! So glad to hear that you spent some time in our city's beautiful green spaces. We look forward to hosting you again soon! Great room, comfortable bed, balcony was perfect for morning coffee. Hi Renee! Thank you for staying at Whitaker Lane. The balcony is perfect for morning coffee! Great location, perfect in almost every way. This was our first time to stay over night in Savannah. We were at the carriage house for 3 nights and it was just as advertised. The location was two blocks away from Mercer House and one block from Forsyth Park. The location could not be more perfect for those who want to explore the City. I really only have minor complaints about the property - mainly don't count on doing a load of laundry. This was a terrible little machine. But, If that is all you can say bad - you know it is perfect. Thank you so much. Hi Christa! Thank you again for staying at Whitaker Lane. We're so glad to hear that you enjoyed exploring our beautiful city, and look forward to hosting you again soon. Nice, affordable, everything you need. So glad to hear that you loved your stay, Stephen! Awesome getaway close to downtown! We loved this home! It is set on a courtyard which is beautiful for having your morning coffee outside. The decor is beautiful and the kitchen was awesome. My favorite part, though, was the rain shower upstairs. So luxurious! Everything was very clean. Our only complaint is that there were a bunch of little sugar ants running around on any furniture that was pushed up against the wall, and also on the bathroom counter. We had to make sure to keep food and drinks away from there. The location is unbeatable! We were surprised at how close we were to everything downtown. Just a block from Forsyth Park, and a few blocks from all the main dining and shops. We loved walking around and exploring the area. We had a little trouble figuring out which door/lockbox was ours, but we called the customer service line and someone was able to assist us. The only downside to staying downtown is that there was no provided parking, so we had to figure out the metered parking for each day. All in all it was a good stay! Hi Bryana! Thanks so much for staying at Whitaker Lane. We're so glad to hear that you enjoyed your downtown getaway, and we will absolutely look into those concerns! Please know you're privy to a Return Guest Discount next time you stay with us. Courtney, thank you again for choosing to book with Lucky Savannah for your anniversary trip! We're so glad to hear that you enjoyed your stay, and look forward to hosting you again next year. My daughter and I visited Savannah and had the pleasure of spending 3 nights in this home. The location was great we were able to walk to a number of different places. The house was very clean and quiet. I was extremely satisfied. So glad to hear that you enjoyed your stay with Lucky Savannah, Jenette! We look forward to hosting you again soon. We were mostly pleased with our rental. It was a bit difficult to locate at first but liked the accommodations other than the washer/dryer which didn't work correctly. We did stay during a holiday which may explain no response from customer service but there was never a follow up and we just bought new towels to finish our stay. Hi Rodney! Thank you for choosing Lucky Savannah. We're so happy to hear that you enjoyed the home and surrounding area, and do apologize for the communication issues during New Year's Eve. We hope to host you again soon! This rental looked bigger in the pictures than it was in person. That being said it was fine for the two of us. We were interested in the design of the rental and were quite pleased with want we found. Some problems we encountered were, the light by the door into the rental did not work. It would have been nice to have light when coming back after dark. We had ants when we checked in, called the rental company and they sent someone over that night to take care of them. He could not figure out how to get the light on. There could be shelves in the cabinets and more than one dish towel. Upstairs there needs to be a curtain for the door leading to the balcony and there should be an instruction manual for the washer/dryer combo. Heating took a little while to figure out and get it set so that it stayed comfortable. On the plus side all the appliances worked and it was great having a large shower, even though it took a long time for water to get to the second floor.The rental was clean when we arrived. It is in a great location making it easy to walk to most places.The rental company was great and answered any question we had. Hi Jim! Thank you for choosing Lucky Savannah! We're so appreciative of your feedback and hope to host you again soon! I was a little caught off guard at first because the door entry was off an alley way. So at night I was a little freaked out. But I was pleasantly surprised that it opened up to a beautiful courtyard. And I later learned that interesting entrances is just part of Savannah’s old world charm. Loved the property! Would stay again and definitely would use this management company. Hi Kristen! Thanks again for choosing to stay with Lucky Savannah. The city has so many interesting quirks that sets it apart; we're glad to hear that you enjoyed your time at Whitaker Lane! Wonderful experience. Great space with a great location that gave us everything we were looking for. So happy to hear that you enjoyed your time, Carol! We hope to host you again soon. 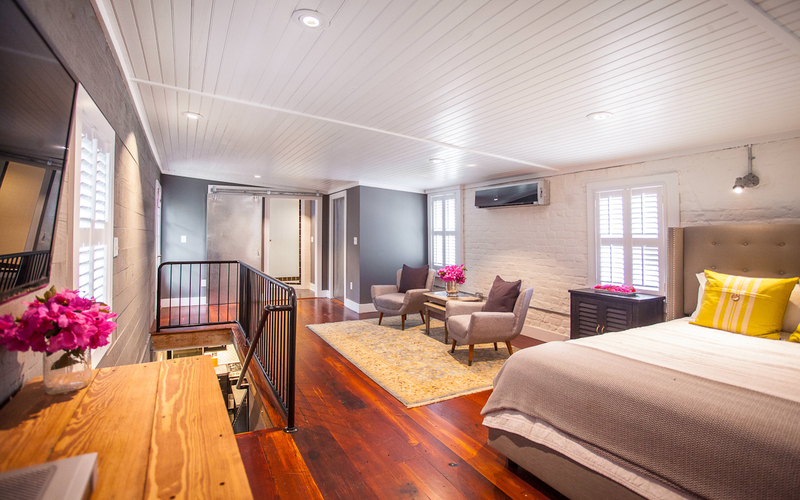 We had an amazing stay in our lucky Savannah carriage house. The property was adorable and very clean. It has everything that we could need during our stay! We even had some key trouble and lucky Savannah was really helpful and quick to come let us into our apartment! Hi Caitlyn! Thank you for choosing Lucky Savannah to host you in the Hostess City of the South! We are so glad that you enjoyed the property and our service. We always strive to provide excellent homes and excellent service. Thank you for letting us know that we hit that mark with you! We hope to host you again soon! The property was great! We loved everything about it and would love to come back. The location is in a great area and we were able to walk to many things! Whitaker Lane - Magazine Worthy Two Storey Bachelor Pad! This was our 7th stay through Lucky Savannah in the last two years - enough said! 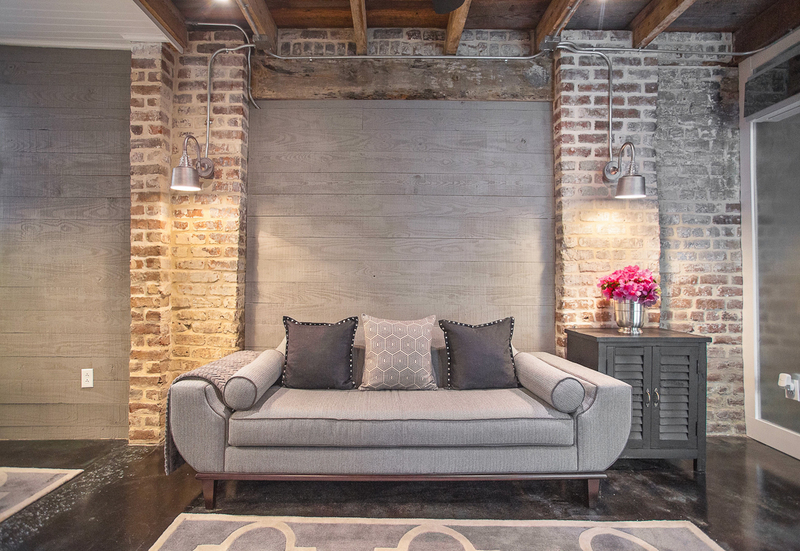 Whitaker Lane is a newly renovated carriage house in the Landmark Historic District exemplifies a masterful re-interpretation of an Old and otherwise overlooked nook into a beautiful pied-à-terre that is emblematic of the New Savannah design aesthetic. 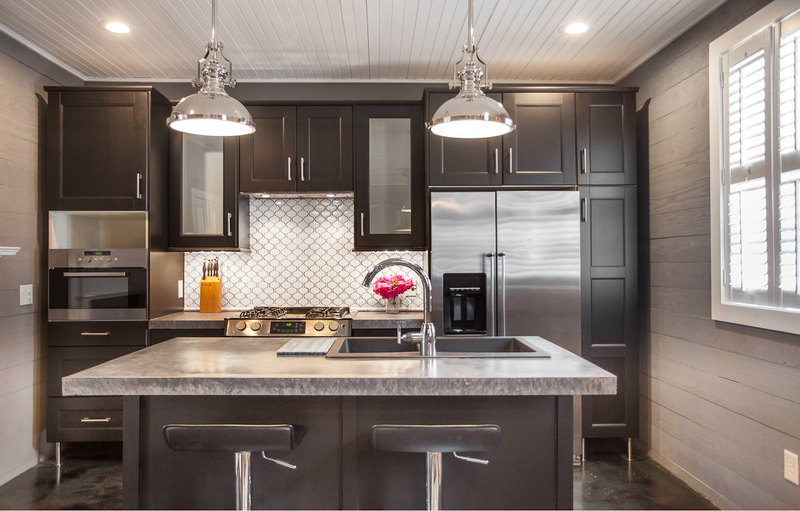 The open main floor kitchen and dining area will make you want to eat-in while the upstairs bedroom suite is a sanctuary from activity filled days! Easy to get to and access all of Savannah. High Style Urban Loft Newly Redone. Still had minor things to complete like kitchen cabinetry and shelving in the kitchen. We will be back again! 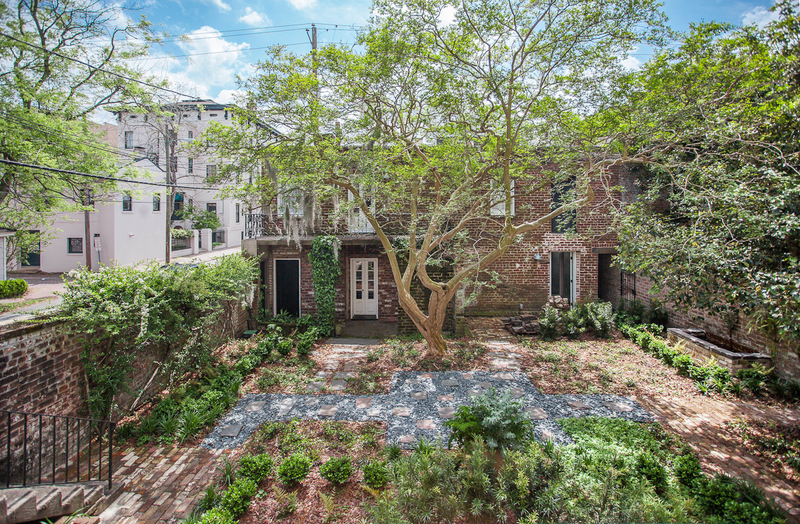 Whitaker Lane is in a great location - just a couple of blocks from Forsythe Park. Walking distance to everything. This is a charming, wonderful place to stay. Spacious and convenient.This place cannot be beat. Lucky Savannah is a great company to work with as well. Very informative, helpful and great customer service.Good restaurants nearby: Local 11 Ten, Cotton & Rye, Noble Fare. Savannah Yoga Center is walking distance as well. Wonderful home close to everything. Excellent location! Great rental experience. Would highly recommend this rental! My wife and I had a delightful stay at 443 Whitaker. The property combined a historical exterior with an modern interior making a wonderful experience. The property was in an ideal location, kitty corner from Forsythe park with easy access to downtown. Thank you for choosing Lucky Savannah for your Savannah vacation! We are so glad to hear you loved the location! We hope to have you as our guests again! 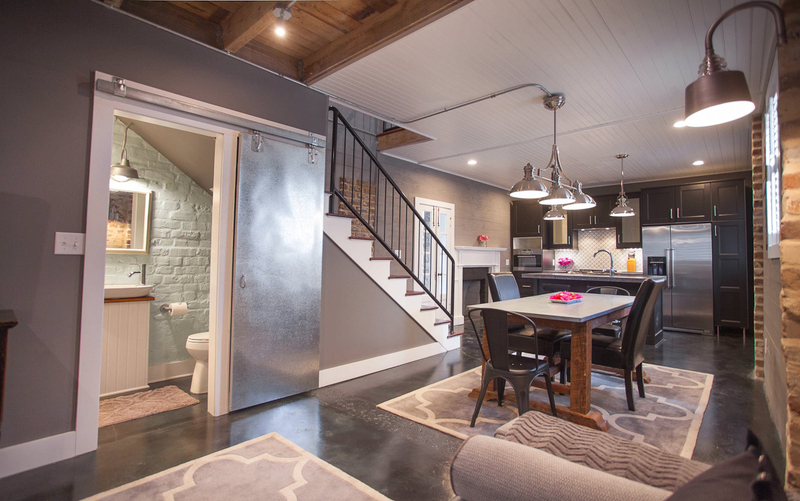 This charming carriage house was absolutely perfect in every way!!! Location was spot on. A few streets away from the busy/ loud streets of river street. 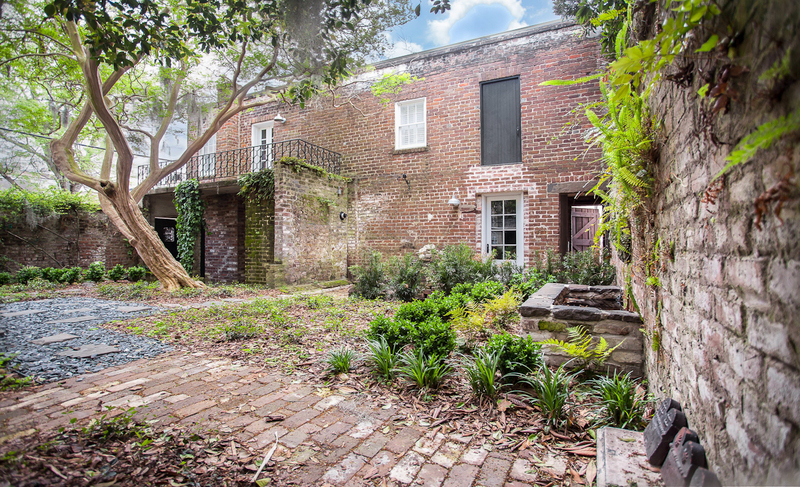 Tucked away in all of the historic, charming Beauty of historic district. Right across from Forysth Park. 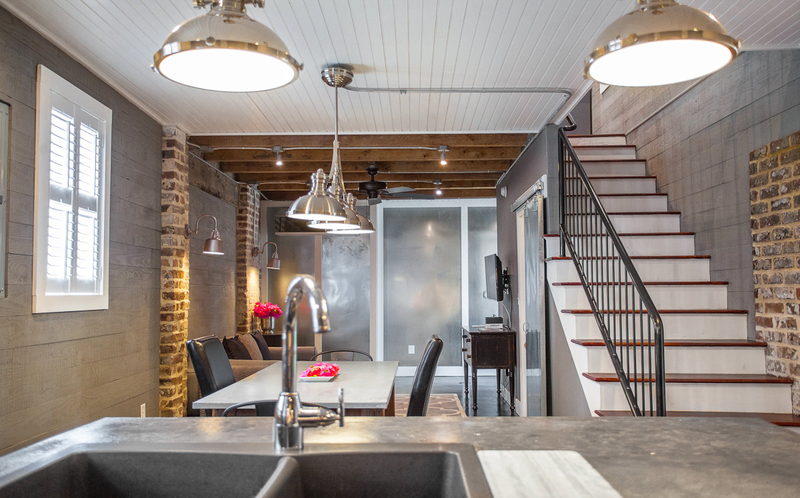 Can't wait to post our trip on our blog which will highlight this charming savannah Homeaway stay. My wife and I spent 4 nights here as a little getaway to celebrate my grduation. I could spend a lot of time raving about this place, but will keep it short and informative. 1. The space is beautiful and well designed. It was very clean. Kitchen is well stocked, but could use a kettle. Only other addition I'd make is a little rug to wipe your feet at the door. 2. 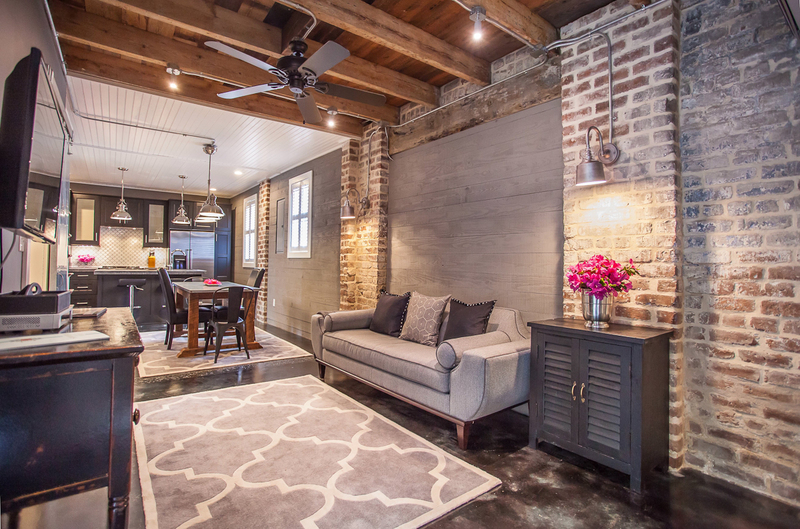 The location is perfect: 2 minute walk from Forsyth park, 2 minute walk from local shops, 15-20 minute walk to River St. We walked or biked everywhere we went and loved the convenience. 3. Parking was easy as pie. We parked on Barnard St. South of gaston for free. Never had trouble finding a spot. 4. Must try places near by: eat and have coffee at Collins Quarter, drinks at The Public Kitchen, Shop at One fish Two Fish, lily bay, and Broughton St.
5. Our only complaint was that the AC units didn't seem to be working properly. This was an issue for us because it was old outside, but this may be an issue for those staying on warmer days. I told the management about this and would suspect they'll have it taken care of. Thank you for choosing to stay with Lucky Savannah! We are glad to hear you all enjoyed your vacation here in Savannah. 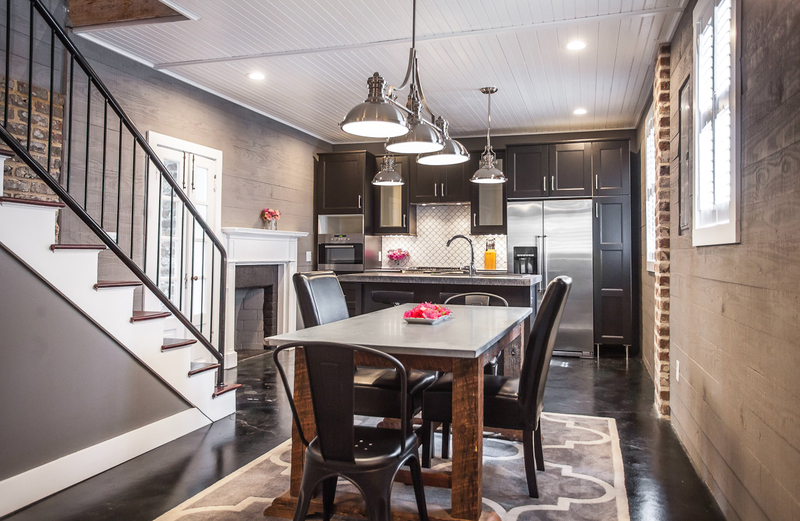 Whitaker Lane is a great choice, especially because of the location! We do thank you for bringing the AC unit to our attention, we have made sure everything is properly working. We do hope to have you all as our guests again soon! We had a great wedding weekend and Lucky Savannah was very easy to work with! I highly recommend renting from them. Our photographer, Donna Von Bruening, made the recommendation to use this company, and we're grateful! Thank you for choosing to stay with Lucky Savannah! We are so glad to hear you all had a great weekend in Savannah at Whitaker lane. Our staff tries their best to help in anyway possible, and strive to provide excellent customer service! We appreciate the recommendation, and it is greatly appreciated. We hope to have you all again soon! Beautiful little apartment in a fabulous location! We loved Whitaker Lane! 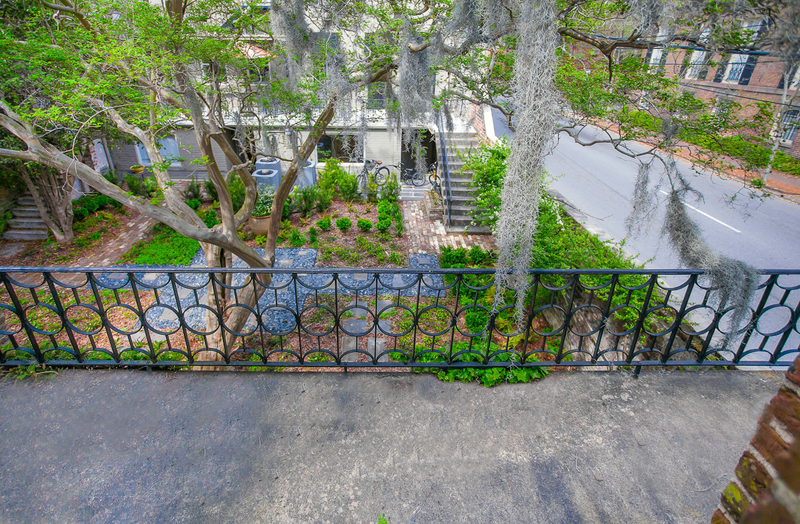 This property is close to fantastic restaurants and within walking distance to Forsyth Park and many historic sights. This is my second great experience with Lucky Savannah properties and I look forward to many more in the future. Thank you for choosing to stay with Lucky Savannah! We are pleased to hear you all loved Whitaker Lane. 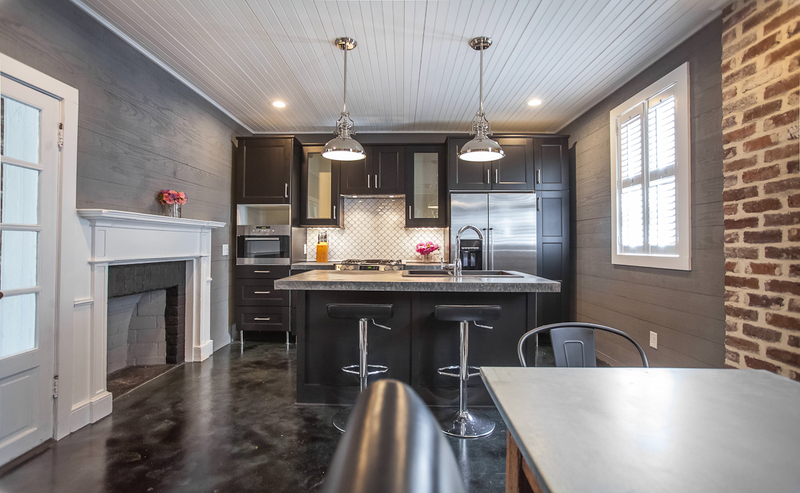 This home is in a fantastic location, only one block away from the city's largest green space, Forsyth Park! We thank you for returning to Lucky Savannah, and we can't wait to host you all as our guests again. My (new) husband and I live in Tampa, FL so we visit Savannah fairly often - About 2 - 3 times per year. So, we decided to do a long weekend in Savannah (our favorite place) for a short honeymoon. We usually stay in a hotel, sometimes in mid-town to save some $$, but lately we really like staying downtown and it's worth the extra money spent per night for the convenience. When I came across Lucky Savannah, I knew we just had to rent from them! The apartment was exactly as described and pictured. Extremely clean, well-maintained, and we had NO issues with anything. It was about 0.8 miles from River Street, which wasn't even an issue as the weather was amazing and it was a straight walk downtown (and after all the food you eat, the walk is worth it!). I would absolutely recommend Lucky Savannah to anyone, and will absolutely be booking with them again in the future. Hi Megan! Thank you so much again for choosing to stay with us. We're so glad to hear you enjoyed Whitaker Lane and our beautiful city. We pride ourselves on being more than a vacation rental company and are pleased to hear that our staff was helpful during your stay. Please know that you're privy to our Friends and Family discount next time you stay with us. Looking forward to hosting you again soon! Our stay was wonderful-the location was perfect! We walked most of the time and found a free parking space only a block away. We liked the character of the carriage house and the balcony and courtyard were nice in the evening. Dealing with the management was very easy. Thank you for choosing to stay with Lucky Savannah! We are so glad you all had a wonderful time at Whitaker Lane, and in Savannah. 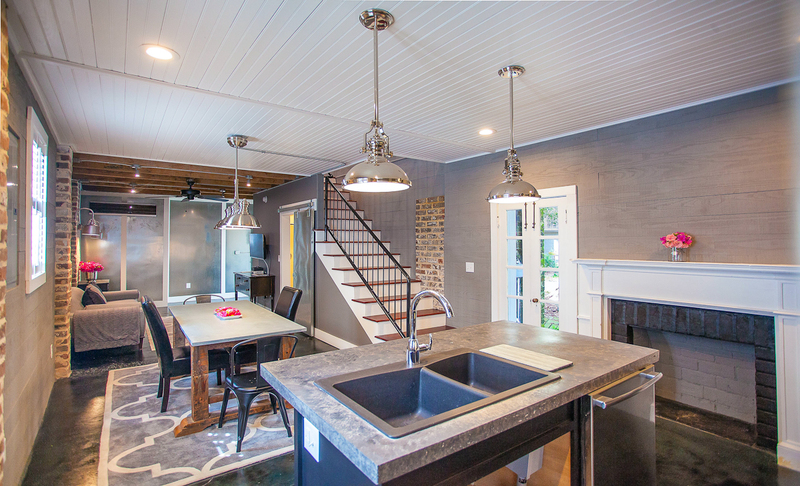 This home is in a great location, only one block from the city's largest green space, Forsyth Park! We hope you all return to Savannah again soon. place looked brand new. I really liked the app lucky savannah has it was very helpful. Hi Aaron! Thank you so much again for choosing to stay with us. We're so glad to hear you enjoyed your first trip to Savannah at Whitaker Lane. We pride ourselves on being more than a vacation rental company and are pleased to hear that our app was helpful during your stay. Please know that you're privy to our Friends and Family discount next time you stay with us. Looking forward to hosting you again soon! This place was absolutely perfect in every way. Thank you for choosing to stay with Lucky Savannah! We are ecstatic Whitaker Lane was a great option for you all. This really does home have so much to offer! We look forward to hosting you all again. Space was clean and had an industrial, minimalist look. The lighting throughout was dim so apartment seemed a little dark. There was not a single picture or any type of art work anywhere. I would suggest maybe some photography or something with a bit of color to brighten up the space. The bed was comfortable and the bathrooms were nice. There was a combination European washer/dryer which we were unable to figure out. There were no instructions. Even though was no specific parking lot. It wasn't too difficult to find spaces on the streets around the corner. Whitaker street is a major road and was noisy during the day but quieter at night and we had no trouble sleeping. It was a decent place to stay despite the minor problems. Thank you for choosing to stay with Lucky Savannah! We thank you for your input, and will be more than happy to notify the homeowner of these suggestions. We will be sure to put instructions in the home for the Washer/Dryer so this will not be a problem for future guests! We do hope you all return to Savannah again soon. The only thing I would suggest is putting a house number on the door. When we first walked in the gate we walked up to the other apartments in the court yard. 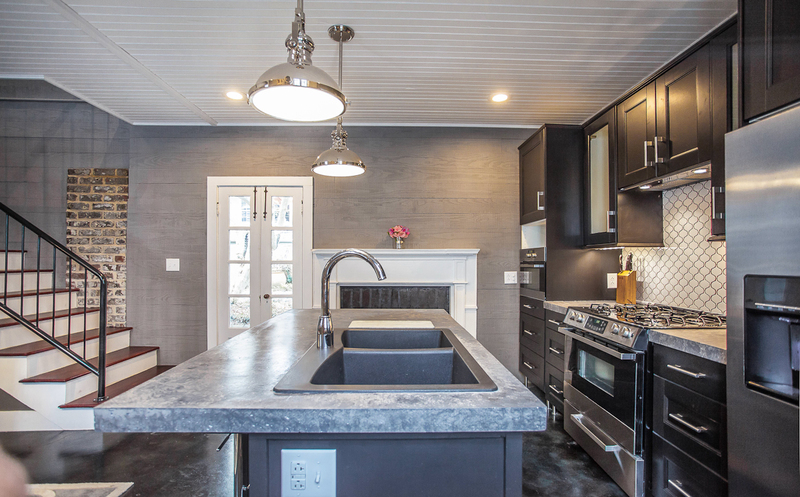 Charming, Modern Carriage House in a Great Location! 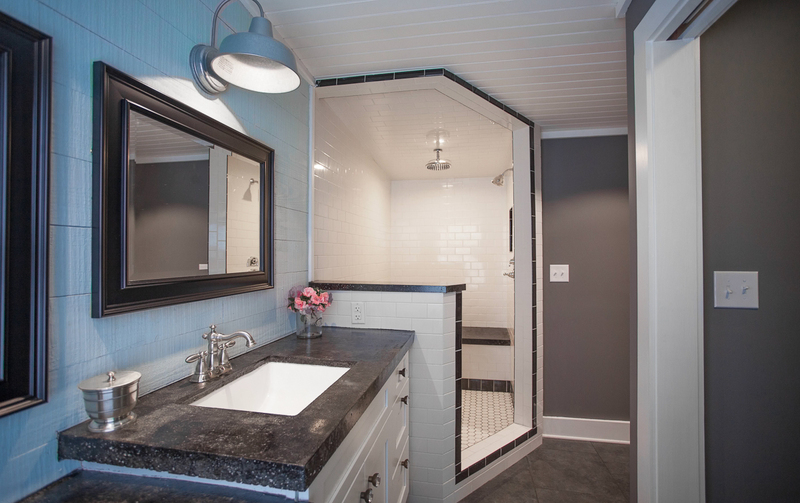 This property was very well laid out and made good use of a smaller space. It was almost immaculate, but the rugs do need to be shampooed. The location was great since it's convenient to everything but somewhat tucked away. However, it is right next to a busy street which can be quite noisy due to the traffic and garbage trucks that come by around 7:30 each morning. I would also suggest adding some blinds or curtains for the doors to help decrease the light from the street and cars passing by. Overall, we were very pleased with our stay and recommend this property. Thank you for choosing to stay with Lucky Savannah! Whitaker Lane is a beautiful property, and has much to offer. We thank you for bringing this to our attention and will be sure to have the rugs shampooed for our future guests! We are thrilled to hear you all will recommend this property and were very pleased. We can't wait to have you all again! Great place in downtown historic Savannah. Great home with lots of character. Would have liked a bigger coffee pot. Good location for walking. We parked our car and walked everywhere we wanted to go. We really liked the apartment and its amenities . The place was clean overall except stained rugs which should be replaced I would suggest . Very comfortable bed . We really enjoyed walking the main streets etc . Would return and recommend . Hi Stephanie! Thank you so much again for choosing to stay with us. We're so glad to hear you enjoyed Whitaker Lane and have made note on of your suggestions. Please know that you're privy to our Friends and Family discount next time you stay with us. Looking forward to hosting you again soon! Whitaker lane was a great place to stay! About a 15 minute walk to the main streets in Historic Downtown. 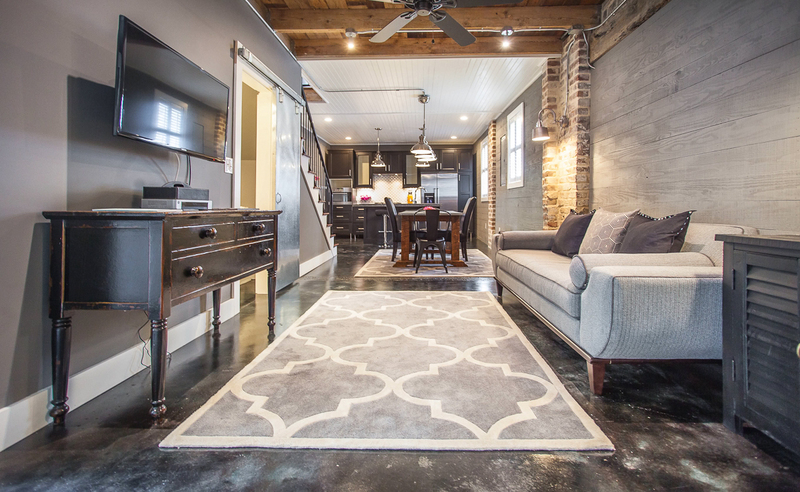 Would definitely recommend this property and Lucky Savannah rentals! Hi Kimberly! Thank you so much again for choosing to stay with us. We're so glad to hear you enjoyed Whitaker Lane and our beautiful city. Please know that you're privy to our Friends and Family discount next time you stay with us. Looking forward to hosting you again soon! The apartment is as pictured. The neighbourhood is quaint and within walking distance of many tourist spots. As it is a carriage house with no insulation you will hear any noise from the street. It was underequipped with several items necessary for cooking but the property management team is responsive and provided good customer service. I am sure this will be rectified for future guests. Hi Tammy! Thank you so much again for choosing to stay with us. We're so glad to hear you enjoyed your time at Whitaker Lane. 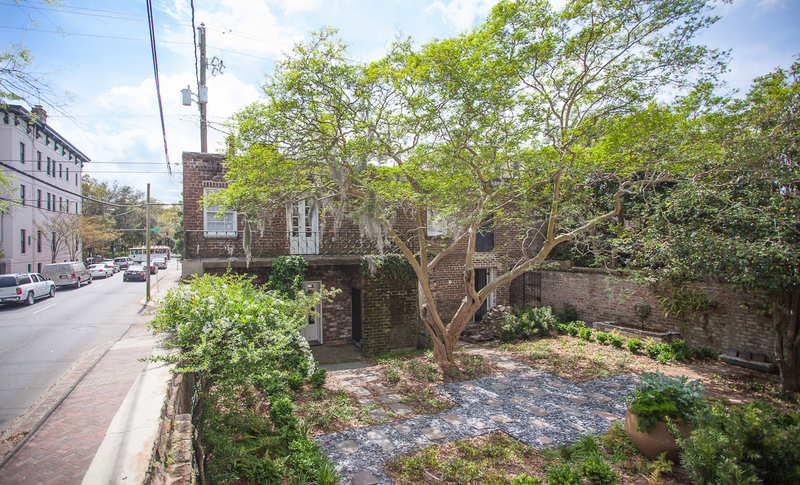 As with most historic homes in downtown, city noise is to be expected but is what we feel part of the overall Savannah experience. Thank you for making note of our responsive management team and we look forward to hosting you again soon. Let me start by saying Brooke of Lucky Savannah goes beyond to help and make you feel comfortable if it was not for her we would of been completely lost. The apartment is a beautiful place nice and comfortable close to the river walk and historic savannah. One bad thing the tv you only have 5 or 6 channels available sometimes you wanna stay in for dinner and watch a nice movie and that is not possible. Hi Lourdes and Robert! Thank you so much again for choosing to stay with us. We're so glad to hear you enjoyed Whitaker Lane and that our staff went above and beyond your expectations. Please know you're privy to our Friends and Family discount next time you stay with us, and we look forward to hosting you again soon. Hi Jennifer! Thank you so much for choosing to stay at Whitaker Lane. We're so glad you enjoyed the decor and location, and we look forward to hosting you again soon. My wife and I visited Savannah for the first time, for her birthday. 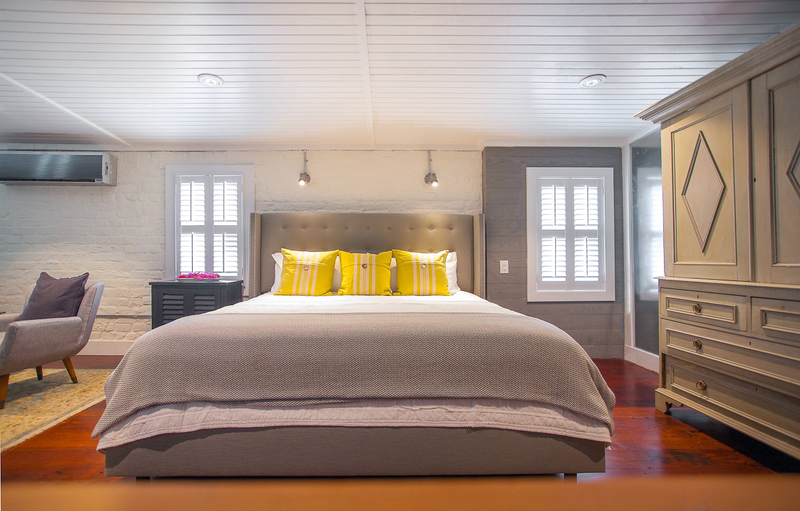 The experience of staying in the Historic District in a renovated historic carriage house, was exactly what we wanted. The location and condition of the Whitaker Ln house was great. Perfect for a couple. Hi Bryan! Thank you for staying at Whitaker Lane for your wife's birthday. We look forward to hosting you again soon! Absolute loved staying here - the apartment is exactly as pictured - a beautiful conversion with the most comfortable bed! The location is fantastic - just north of Forsyth Park so really easy to get everywhere on foot. Check in and out was really easy with the Lucky app. Noise was not an issue for us. Would definitely stay here again! Hi Danielle! Thank you for choosing to stay at Whitaker Lane. We're so glad you were pleased with the location and comfortable bed, and look forward to hosting you again soon!